Wing (parapodial) retraction in the pteropod mollusc Clione limacina is a reflex triggered by tactile stimulation. Light and transmission electron microscopy revealed three groups of smooth muscles in the wing hemocoel that participate in retraction movements: transverse, longitudinal, and dorsoventral. Among these, two subtypes of muscle cells were identified. The first (type A) appears in all three groups and forms a well-organized lattice-like structure. The second (type B) is the major component of transverse muscles and runs in one direction only. 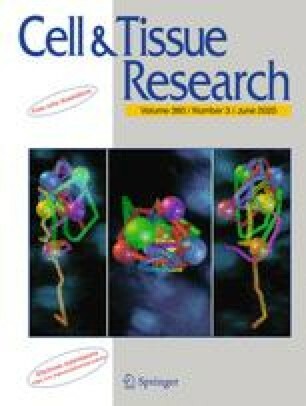 Quantitative ultrastructural comparisons of dimensions, abundance, and organization of dense bodies, thick and thin filaments, membrane invaginations, sarcoplasmic reticulum, and mitochondria suggest that type A cells are able to contract and relax more quickly with less endurance whereas type B cells are capable of generating stronger contractions with more endurance and slower relaxation speed. Furthermore, type A cells have a unique pattern of thick filament organization, here referred to as pseudosarcomeres. The roles played by the different cell types in wing retraction are discussed.